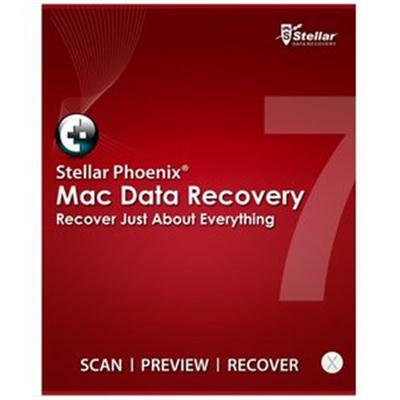 Stellar Phoenix Mac Data Recovery - Bring Your Lost Data Back to Life. Mac data recovery software to restore documents, photos, music or videos lost due to deletion from any HFS, HFS+, FAT, ExFAT and NTFS format based file system. Stellar Phoenix Mac Data Recovery Software offers a wide variety of helpful features to let you pull your data back from inaccessible volume. Be it documents, photos, music or videos, this software performs recovery on different kind of data after disasters like drive formatting, accidental deletion, virus / malware attack and similar issues. It makes use of advanced techniques to scan your entire hard drive for recoverable files and lets you recover them with ease. This software's powerful algorithms make recovery of even permanently deleted files possible. Whether you have emptied your Mac's Trash or performed the 'Command+Shift+Option+Delete' operation, this software makes it extremely easy to undo file delete operations. What's more, all deleted files are restored with their original names. Stellar Phoenix is the global pioneer for this feature in the field. No matter how your data has been deleted, this software will bring back your data in no time. If you can't find existing volumes on your iMac, Mac Pro, MacBook Pro, MacBook Air, or Mac Mini, what you need is Stellar Phoenix Mac Data Recovery. The software can locate and rebuild corrupted volumes or volumes deleted from any HFS, HFS+, FAT, NTFS, or ExFAT formatted drive conveniently to help you get your valuable data back. This application can accurately recognize over 122 different file types and recover Mac deleted files by matching signatures. Comprehensive scanning routines search every bit of lost or deleted data on your hard drive's volumes and help to recover it smoothly. This RAW recovery feature comes in handy in case your drive's volumes have been severely corrupted. If Data Recovery and Deleted Recovery options do not produce the results you expect, RAW Recovery is the way to go! Photos capture our cherished memories and no one wants to lose them. With this software you don't have to worry about losing your precious pictures any more. It can recover lost, deleted or formatted photos of any file format (jpeg, png, gif etc) from any internal or external Mac hard drive, USB drive, digital camera, memory card, SD card, flash card, etc. The tool acts as a data rescuer even when your system fails the boot process. This Data recovery Mac software is available with a Bootable system startup DVD that comes handy in times of boot failure. You can start your Mac system with the help of this Bootable DVD and use Stellar PhoenixВ® to scan & regain access to all your lost data. The ultimate usability of the Mac data recovery software is realized with its support for Boot Camp partition recovery. The software supports data recovery from NTFS partitions on Mac and gives you a hassle-free experience when recovering files from Windows Boot Camp partition. Regardless of whether your Mac is setup as a standard Boot Camp dual-partitioned disk, you can have your best shot at recovering lost data from Windows partitions on Mac. Equivalent to a System Restore point, the "Create Image" feature of this data recovery Mac software allows creating an exact image of the Mac hard drive that can be used in situations of crisis. If you find that your hard drive has bad sectors, this functionality can be deployed to create and keep mountable image of your Mac hard drive, volume, or selected region so that even in case of media failure, you will have a complete backup. So you're hard drive is password protected? No Problem! Stellar Phoenix Mac Data Recovery can bypass encrypted file systems and recover your valuable data. The application provides 'Quick Recovery', 'Advance Recovery', 'Deleted Recovery', 'Raw Recovery', 'Photo-Recovery' and 'Create Image' options for encrypted file systems. If you need to interrupt the recovery process at any time, the Resume Recovery feature allows you to save the image of the process (.dmg) on the disk and resume it at any later point of time. With this option, you can resume the previously saved 'Scan Information' or 'Drive Image' to restore your lost or inaccessible data back. CDs / DVDs often face physical damage in the form of scratches. As such they become unreadable and hence the data on them becomes inaccessible. Stellar Phoenix Mac Data Recovery acts as the savior that can efficiently grab all your seemingly inaccessible files stored on damaged or improperly burnt optical media (CD & DVD). The software supports recovery from all common file systems of optical media, such as ISO 9660, Joliet, UDF, HFS and RockRidge. Different categories of scanning modes assist in deciding the level of scan required. If you've accidentally deleted your data by emptying the Trash, the "Quick Scan" mode can quickly scout for the deleted files. However, if data loss has occurred post volume formatting, a deeper "Advance Scan" can be selected which will take slightly more time but produce significantly better results. The "Advance Scan" option is specially recommended for Mac external drive recovery. Connect HFS, HFS+, NTFS or FAT formatted external hard drive to Mac and recover all deleted, formatted, inaccessible files. This data recovery Mac software is compatible with all make or models of external hard drives. It also recovers data from an unmounted external drive. The Time Machine backup drive recovery feature is a new feather in the cap of this brilliant software. If your Time Machine backup drive has suffered file structure corruption resulting in inaccessibility of data, Stellar Phoenix Mac Data Recovery will come in handy to recover all your data smoothly. Just connect your backup drive to your Mac and the software will treat it as a usual drive. Thereafter, you can recover your lost data through the Recover Data, Deleted File Recovery or Raw Recovery options like any other drive. The latest version of Stellar Phoenix Mac Data Recovery comes with a striking new user interface that is both smart and simple. Appropriately explained options and detailed categorizations make recovering data effortless. Plus, features like checking / un-checking files and folders for recovery using space bar, advanced filter options for files, eye-icon for displaying information about a file and multiple viewing modes (Detail, List, Thumbnail) for scanning results makes the entire process quicker and more user-friendly. With updated drive information and SMART Status of drive, this application lets you know more about your Mac hard drive and volumes than any other data recovery software. Additionally, it offers options to make data recovery safer for your Mac. If a huge amount of data needs to be scanned, you can select the "Minimum RAM usage" option to ensure that your system doesn't freeze of crash due to RAM running low. Also, to prevent system freeze while previewing corrupted files during scan, the software offers such preview in safe mode both in thumbnail view and running preview. - Supports NTFS File System (Boot Camp Support). - Supports FAT, NTFS and ExFAT file system for 'Quick Recovery', 'Deleted Recovery', 'Formatted Media / Lost File Recovery', 'Photo Recovery', and 'Raw Recovery' options. - Allows searching Lost / Deleted Volumes of FAT, NTFS and ExFAT Formatted Drives. - Updated for JPEG, PNG, GIF, BMP, CR2, CRW, MRW, SR2, SRF, TIFF, NEF, ARW, HDMOV, PEF, RAF, ERF, DNG, X3F, and ORF file formats in Photo Recovery. - Shows resolution, camera model name, creation and modification date, and time stamping support for some file formats in 'Photo Recovery' option.